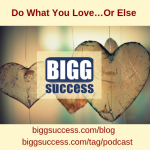 Yesterday, we discussed why defining your core values helps you live your dream life. You won’t have peace of mind if your life isn’t consistent with your values. Knowing your values invigorates you. You see the bigg picture – your current situation may not be all you dream of, but you can see how it’s getting you where you want to be. We’re working toward a written statement of values. Having your values in writing makes them more tangible. It keeps them in front of you. You’re forced to analyze them more thoroughly than if you just keep them in your head. Let’s look at two techniques you can use to discover your core values – yours, not someone else’s. Whichever technique you use, you’ll want to find a place that’s conducive to creative thinking. Select the ten things you think are most important from our list of values. It’s not easy, but that’s the point – discovering what you value the most. Keep in mind that this list is by no means exhaustive. Feel free to add your own values. Once you’ve done that, up the ante. Choose the five values that are most important to you. Then four … three … two … one. You’ve just created an ordered ranking of your five most important values! Start with a blank sheet of paper (or a blank word processing document, if you prefer to type). Write “What’s most important to me?” at the top. Now brainstorm. Write freely – don’t analyze. Anything and everything that comes to mind. Now get away from it. Come back to it again. Don’t worry if a couple of days pass. When you return, look at your list. Do you want to add anything? Cross something off? Have at it – it’s your list. Next, look at each word. Ask yourself what it means to you. For example, maybe your wrote down money. Money can mean income, wealth, freedom, security …. what does it mean to you? You’ll often find that what you value is underlying the word you wrote. Dig deep. Now, start eliminating values so you end up with an ordered ranking. You may find that combining the two techniques works best. Start with the first. Look over the list. Then get away from it. Return to a blank sheet and start brainstorming. Visualizing your dream life, free of constraints, helped you uncover your passions. Now we’re bringing beliefs to those passions, which defines your values. That’s the life you want. In a couple of weeks, we’ll bring in the constraints; we’ll assess where you are. Then we’ll develop strategies to link the two together. Our quote today is by the French writer and philosopher Michael de Montaigne. So seize today. Value your life and live your values. Next time, we’ll talk about success snake oil – know when you’re getting scammed. We’ll recount some recent experiences. Until then, here’s to your bigg success!